Newly released concept art for Avengers: Infinity War includes a much bigger fight between Thanos and Thor. Marvel's Avengers: Infinity War - The Art of the Movie book hits bookshelves tomorrow, but there have been a few pretty cool leaks over the last few days. We've seen different looks for Steve Rogers and Bucky Barnes, as well as some radically different designs for Thor's suit as well as a giant gun for the hero in place of the mighty Stormbreaker axe. Now, we've got a new look at the final battle from the film. 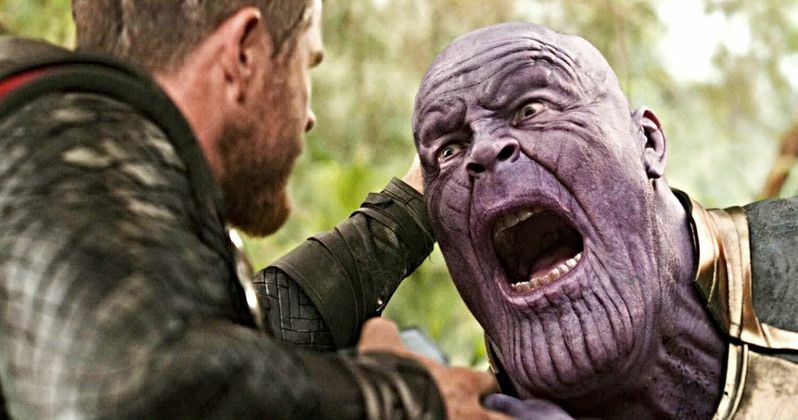 Marvel's Avengers: Infinity War - The Art of the Movie shows that Russo Brothers originally intended to have more Avengers battling Thanos at the conclusion of the movie, instead of it just being a one-on-one battle with Thor. The concept art makes it look similar to the battle on Titan where Spider-Man, Iron Man, Star-Lord, Drax, Nebula, and Mantis nearly take down the powerful villain. In the artwork, Steve Rogers and Hulk are holding the Mad Titan's arms as the God of Thunder swings his axe into the villain's chest. The Infinity War concept art makes it look like the battle was a lot more intense than what we ended up seeing on the big screen. Looking past the epic battle depicted in the art, fans will automatically ask about Hulk being included in the scene, since he was having a struggle with Bruce Banner. It looks like the original intent was to have Hulk fighting with the Avengers at the end of Infinity War, but was later changed for reasons that are currently unclear. Avengers 4 should shed some more light on the true reasons that Hulk didn't want to obey Bruce Banner's wishes during the epic battle on Wakanda and earlier in New York. Many fans assumed that Hulk was scared after his first encounter with the Mad Titan, but the Russo Brothers later revealed that it was more of a power struggle between Banner and Hulk. Whatever the case may be, Marvel's Avengers: Infinity War - The Art of the Movie book provides some excellent insight into how the film was put together and how many changes went on behind-the-scenes. Now that Marvel Studios is slowly pulling veil off of Infinity War, it's time to shift the focus to the upcoming Avengers 4, which many Marvel Cinematic Universe devotees started to do the second after they saw Avengers 3. The long-awaited title reveal and trailer will be out before the end of the year, but the exact date and time has not been announced by Marvel Studios at this time. You can check out the latest concept art from Infinity War below, provided by the Film Nerd Twitter account. And then Marvel's Avengers: Infinity War - The Art of the Movie will be out tomorrow, November 6th.